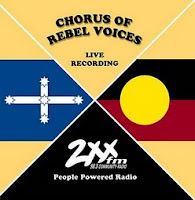 I present 'Rebel Chorus' on 2XX 98.3 FM on occasional Saturdays from 10am to 12pm. The show runs every week and has done so for more than 20 years. I track my playlist on AMRAP and you can view the songs here. Please support your community radio station - you can listen to the live stream at any time.